Press the curtain on the floor and pillar until it disappears, use a match to light the lantern. Press the large rock on the left and slide the curtain to the right. Use the lantern to see numbers. Press the numbered circle and press the number 2383. Look for the key in the book. 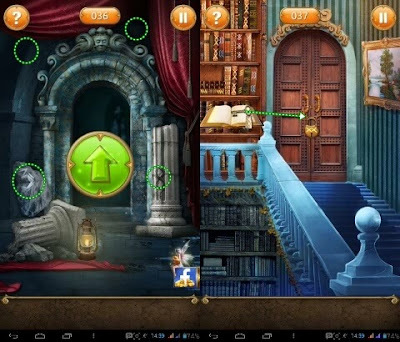 Press the book at the bottom of the bookcase and use the key to open the door. Grab the golden stick and book at the bottom of the cabinet. Use the stick/crowbar to the door. Tilt your phone to the left or right so that the item presses the button. Press the bell on the table so a broom moves to clean the cobwebs. Calculate and remember how many times the broom moves. Press the numbered circle to the right of the wall and press 2332. Look for the key in the book. Press the book at the bottom of the bookcase to get a key.